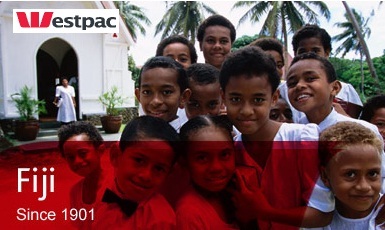 FIJI NEWS - Westpac Fiji, the longest serving bank of the country, marked 110 years of service in Suva. The bank started its operation in 1901, and now it has a forty per cent market share in Fiji. On the celebration occasion General Manager Jason Stephens of Westpac Fiji said the success of the bank is a testament to the commitment it gives to the employees and customers. He added that few dramatic changes were on the growth path of the bank but it has always played a pivotal role in Fiji, which is more than just offering banking services to the Fijians. Stephens mentioned that 95 per cent of the Westpac Fiji employees are Fiji citizens, and 35 per cent of the team leaders and managers are women. Earlier only New Zealanders and Australians ran the bank, and it only had male managers. A cake cutting ceremony was held in the two weeks celebrations of Westpac Fiji at its flagship branch in Suva. The ceremony was attended by Barry Whiteside, Governor of Reserve Bank of Fiji, and Chairman of the National Trust of Fiji Robin Yarrow, along with the executive staff of Westpac. Westpac, registered as Westpac Banking Corporation, is the second-largest bank in New Zealand, and one of the 'big four' banks in Australia. With headquarters in Sydney, Australia, the bank was founded in 1982 as Westpac. Currently the bank serves in Australia, New Zealand, Fiji, Papua New Guinea, Samoa, Solomon Islands, Tonga, Vanuatu, Singapore, Hong Kong, China, Indonesia, United States of America and United Kingdom.